As Herr Boch finished the last lecture of the school year, I sketched one final caricature of him into the margins of my notebook. "Fourteen-year-old Karl Stern has never thought of himself as a Jew. But to the bullies at his school in Naziera Berlin, it doesn't matter that Karl has never set foot in a synagogue or that his family doesn't practice religion. Demoralized by relentless attacks on a heritage he doesn't accept as his own, Karl longs to prove his worth to everyone around him. So when Max Schmeling, champion boxer and German national hero, makes a deal with Karl's father to give Karl boxing lessons, Karl sees it as the perfect chance to reinvent himself. A skilled cartoonist, Karl has never had an interest in boxing, but as Max becomes the mentor Karl never had, Karl soon finds both his boxing skills and his art flourishing. But when Nazi violence against Jews escalates, Karl must take on a new role: protector of his family. Karl longs to ask his new mentor for help, but with Max's fame growing, he is forced to associate with Hitler and other Nazi elites, leaving Karl to wonder where his hero's sympathies truly lie. Can Karl balance his dream of boxing greatness with his obligation to keep his family out of harm's way?" I'd had this novel in the back of my mind for a while, but I finally checked out a copy of it from my school library, which has quickly become a great source of books. I wish I'd read it sooner; while it's not as heartbreaking and emotional as other YA World War II books like Code Name Verity and The Book Thief, it had its points and was definitely very entertaining. I learned about a whole new world too: that of the German boxing scene which the unlikely Karl Stern becomes part of. You wouldn't normally think of him as a fighter; when the book opens he's really skinny, and dreams of becoming an artist. He also gets beaten up at school despite the fact that his family doesn't practice Judaism at all. I really enjoyed the characters in this book, as well as the historical detail (I love World War II fiction). The plot conceit was also really interesting and kind of unique too; it shifts the focus a little to talk about something that no other World War II novel I've read talks about. Admittedly, I'm not that interested in boxing, and I take Greta's view on it, but I still enjoyed reading Karl's story and reading about the details of the boxing ring and the club where Karl trains. Sharenow added a lot of nice details, and I read The Berlin Boxing Club fairly quickly. It wasn't suspenseful, exactly; more like you just got drawn in, and didn't realize how quickly you were reading. And that was an excellent part of the book. Some parts of the book were really moving, especially the way Karl reacts to the bullying of his more obviously Jewish neighbors, particularly Mr. Greenberg. He channels his anger into the boxing, and it helps him get better and better at his new passion. It's certainly better than trying to pick a fight, which would get him and his family into a lot of trouble. Despite my lack of interest in boxing, I found the sections pertaining to the boxing very interesting and insightful. It's an excellent new angle to take, and an interesting way for people to channel their natural aggression and anger. I also thought it was kind of ironic that Jews at the time right before World War II and before the big restrictions were allowed to box, to fight. Meanwhile, shops were being vandalized, and people tormented in the streets. Maybe The Berlin Boxing Club wasn't quite as raw as The Book Thief or Code Name Verity, but nevertheless certain sections of it were still really sad. Right after Karl's first real boxing match, something very bad happens, and the way it was written wasn't over-dramatized, but it still felt really real, the conflict between Karl's parents, who have different strategies and ideas of what to do in a tough situation like the one they're in. 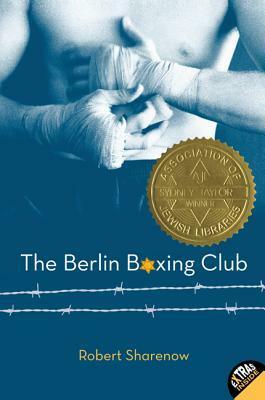 Other parts of the book too really rung true to me, and overall, The Berlin Boxing Club was pretty well written and plotted. I ended up really enjoying it, though it's certainly not as good as the other two young adult World War II novels I've mentioned in this review. It's still worth reading though, whether you're interested in boxing or not. I call it a World War II novel, but all of the actions actually take place before the war breaks out; still, it's very much centered on World War II.